One of the quirky things about my daughter is that like many other autistic children, she has an affinity for unusual objects and forms attachments to them. There was a long period recently when her favorite toy was the cheese grater. 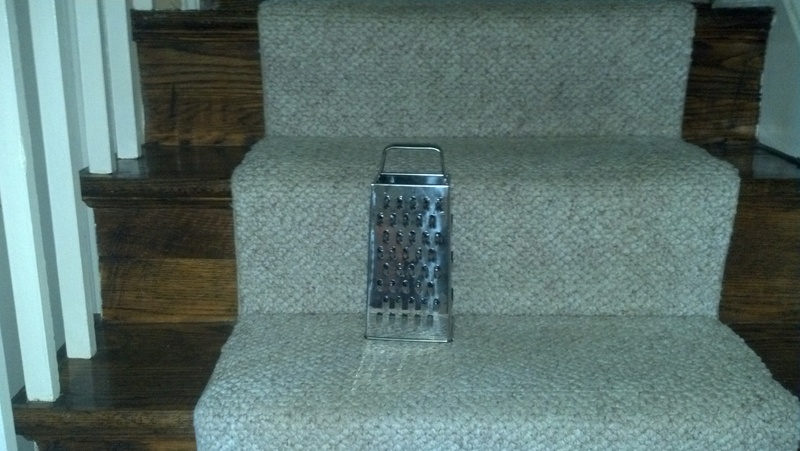 Yes, I am referring to the kitchen tool that you use to shred and grate cheese. She just loved it – she would go to the kitchen drawer at her first opportunity, pull it out and run off with it somewhere. I would often be making something in the kitchen, only to discover when I looked in the drawer that the cheese grater was missing, and I would have to set about the house in search of Allison and the cheese grater. I will never know the reasons for her adoration of the cheese grater because she cannot tell us, but if I had to guess, I’d say she liked the uneven surface and the very tactile nature of the implement. The same nature, of course, that makes it sharp enough to shred cheese and cut small fingers. So, I sought to curb Allison’s interest in the grater, certain that it was inevitable that she would eventually cut her hand playing with it. But she never did. Eventually, her interest in the grater waned, and now when I go to shred cheese for an omelet or grate some hard cheese to sprinkle over pasta, it is safely nestled in the drawer where I expect to find it. A friend, also a mother, came to visit earlier this summer and when I told her about this quirk of Allison’s, I laughed out loud, because I am so accustomed to her little quirks and I find (most) of them pretty endearing. My friend, however, looked pensive and worried, both about my daughter’s safety and probably, about my fitness as a parent. That’s how it is around here, though, and that’s as it must be. Sometimes people shake their heads and say to my husband or to me “I don’t know how you do it.” My most recent answer to that question, and it is a truthful one, is that a sense of humor and a load of patience goes a long way. Blaming God for the fact that there are people among us who are sick, or dying, or dealing with disability is much like blaming Henry Ford for every car accident because he invented the automobile. It is possible to create something without intending every consequence that flows from that act of creation. Although that is somewhat at odds with the view of numerous religions that God is omnipotent and is in control of each and every event in the life of each individual, that seems to be an overly simplistic explanation of the nature of God. I think those familiar feelings of anger towards God are rooted in a belief that one must have done something to be unworthy of God’s benevolence or love. But really, that desire or longing is just the same as a longing to be perfect (or for your child to be), and therefore, perfectly worthy of God’s love. It’s just measured on a different scale for our children than most other people’s children. People could be angry at God that their child has flunked math again, or has blown his or her college scholarship, just as often as I could be angry that my daughter can’t speak to me. God must love Allison, then, even with her cheese grater proclivities. And I do also.